As many of you may know, my husband, Andrew is a Master furniture maker and fine woodwork has always been his passion. This is a little french style desk chair that Andrew made last year and I just wanted to share the design and making of it with you. 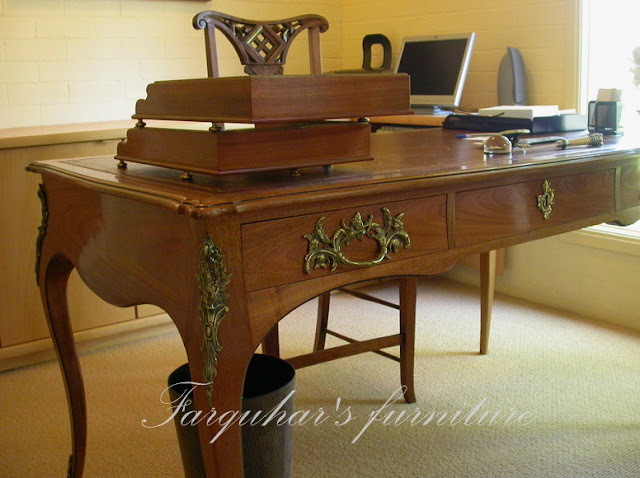 Our lovely client had patiently waited quite a while for her chair to arrive to complete her French style desk, a Louis 15th style Bureau Plat with gold ormolu mounts, complete with a beautiful leather top with hand gold tooling that Andrew made for her home office a couple of years before. He also made the little timber trays on top of the desk as well. The Bureau Plat above made by Andrew before the chair arrived. Both the Bureau Plat and the chair design were inspired by the French 15th/16th Century Louis style and made from our very own local trees here in the Southern Highlands, Australian Black wood timber from Robertson. 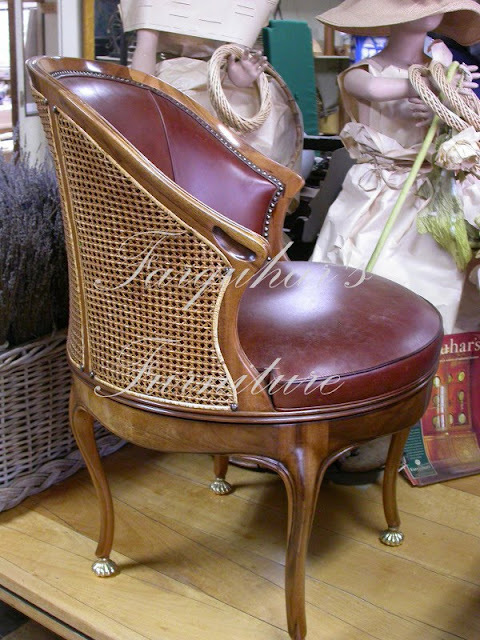 The chair with cabriole legs of course, has traditional upholstery, hand stitched and shaped using horse hair and covered in the same leather to match the top of the desk and detailed with French upholstery studs. 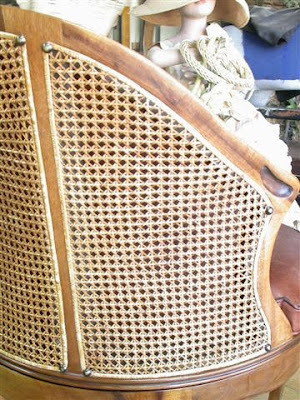 The back of the chair was all hand caned and the entire chair was completely tailor made and fitted to our client's dare I say...'bottom & height'. Everything from the arm rests to the leg heights were measured exactly to her size and even her choice of softness in the seat of the chair, the upholstery had to be not too hard or not too soft. Everything had to be just right. 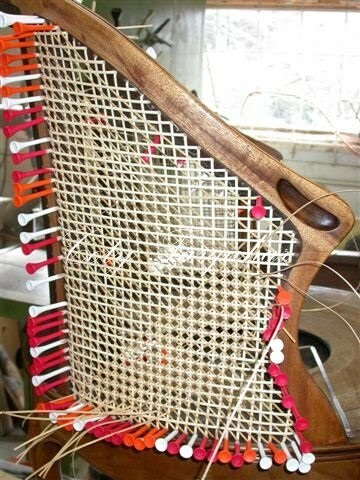 Chairs generally take quite a lot of time to make as they are so detailed, but when your making one chair for one person, keeping the proportions and design right can be quite a challenge. The wonderful part of Andrew's design in this little chair can not be seen in any of these photographs, the chair swivels 306 degrees. The legs of the chair remain flat on the ground while the seat sits on a steel ring with little ball bearings and it ever so beautifully revolves in any direction you want. 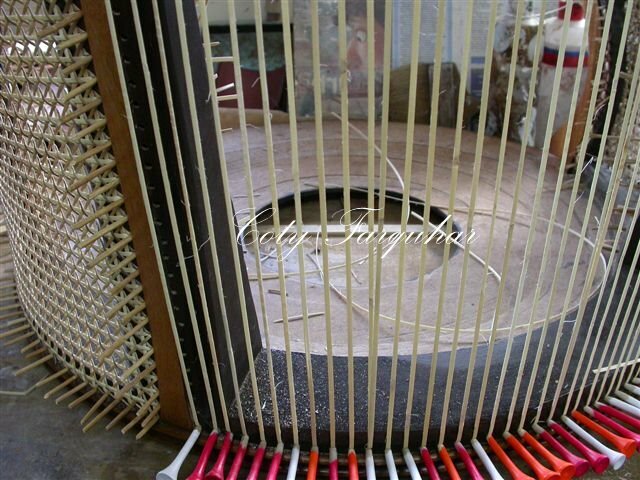 If you look just below the caning and leather seat there is a dark line that separates the top of the seat from the bottom. 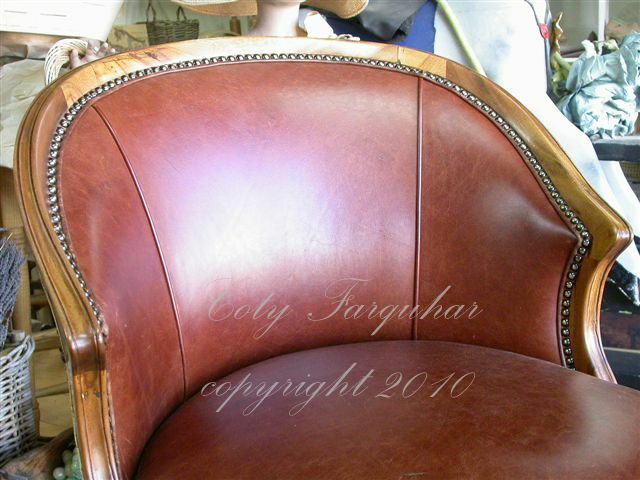 The woodwork was finally French polished polished and waxed to give a warm glow. 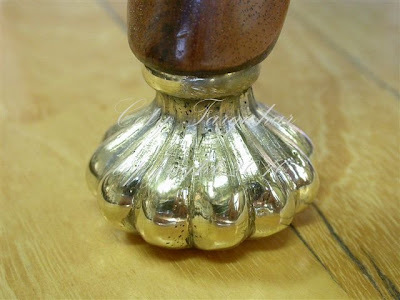 Even the little gold brass feet were also carved and shaped and cast by Andrew and sent to a foundry where models were made and then returned to our workshop to be cleaned up and highly polished so to slide softly over the carpet. It took many months to make this chair and our client was delighted. Before starting on the original chair a full size prototype was made using a cheaper timber so that the size was correct for both the client's body and to fit perfectly with the arms of the chair under the desk while swiveling from side to side. They were a perfect match. My Andrew said, " I loved making this chair to compliment the desk, it was an absolute individual commission in every aspect and I enjoyed working closely with my client to give her something unique. " I am my client's hands and quite often my client's guide my hands"
It's always a little sad to see these lovely pieces leave our workshop when they are complete. I don't know how Andrew does it sometimes after spending so much time building his furniture from the raw wood to the final piece . He puts so much care and attention into every detail. I would like to think that Andrew's love stays in the timber forever. You really should contact Greet from Belgian Pearls, since they have a business interior design and renovation of beautiful houses...Such houses deserve this elegant, highest quality furniture I should think. Otherwise you can find her on my favorites on my blog in the left sidebar when you scroll down. Meaby then you two will pau a visit to Belgium and The Netherlands ? HELLO! I had found your beautiful blog some time ago and then forgot to put it you my roll. Luckily just found you again thru Vignette Design-over our love of Antlers. I am drooling over the chair your husband made. It is truly a magnificent work of art. Oh, how I envy the owner! 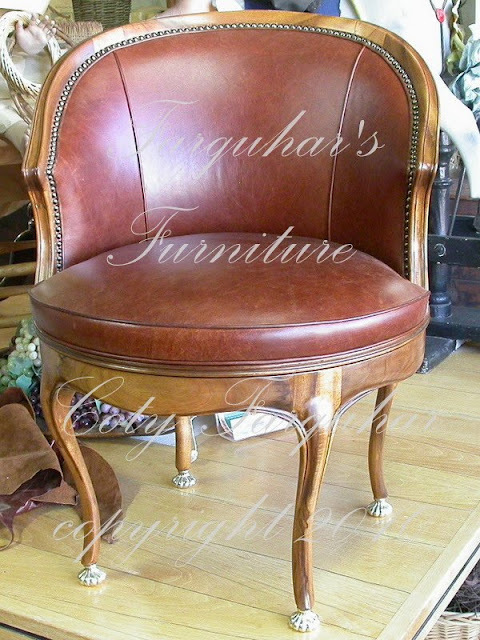 If you have a moment, please stop by for a visit and read my Dunhill Chair: The Saga post so you can truly know how much I love this chair. What an amazing and talented pair are you two! Ps I've just noticed the sidebar item on SHILOH PEPIN.. how incredible and wise...!!! That is a truly beautiful chair! Beauty, quality & craftmanship...you don't see much of that in anything nowadays. Thanks so much for your sweet comment! And thanks for leading me here to your glorious blog. I know Edward and I shall return often! 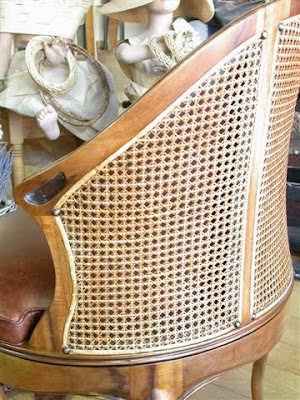 the chair is absolutely stunning, and I dont say that lightly as I am obsessed with chairs! I found you through, RUBY?JULIE? I am in awe, what a genius You have for a husband. What a gift and ARTIST he is. This is such a beautiful site. Here via Julie's gorgeous blog. Condolences on the loss of your aunt. I can't believe I've never been to your site before. How did that happen?? I love it here. Beauty and elegance as far as the eye can see. As for that chair....Due to toddler factor, I'm at the stage of my life where my chairs need to be the sort that you can hose down at the end of the day, so a chair which is such a work of art is truly breathtaking. I agree with you, I don't know how your hubby could let it go. As much as I love the fact that the chair was custom measured, I would absolutely DIE if he insisted on measuring my "seat". He would have to inscribe "wide load" on the back of the chair for OH&S reasons and I'm sure that would not sit well with his artistic sensibilities! Meredy xo.